“I’ve paddled the Pace twice now. First was a gentle paddle in the eddies of the Swellies, then a full on speed training session with JW. I also took the opportunity to put it on show at the Storm Gathering evening talk – lots of admiring comments. What does the Pace feel like? Comfort and fit: excellent, cockpit is at the right angle, seat is in the correct position, backrest does not interfere with rotation at all. The footrest is in the correct position, and at a good height. Construction: weight and stiffness is good, certainly stiff enough for the squeeze test, and light enough to carry – good balance for day touring and racing, and probably good enough for some heavy use too. No creaks or groans, no bending etc. I’ve not launched it off a wave yet, but I suspect it’ll be just fine. I can put all my weight on the roof-rack straps, no crushing at all. The rudder controls take a bit of getting used to, but I’ll fine tune the set-up. How does the Pace feel to paddle? Stability: with the rudder blade down I reckon I could stand up in this boat. Rudder up and it’s about similar to an Xplore-S. Rudder down and at cruising speed, absolutely rock solid – easily as stable as an Xcite. 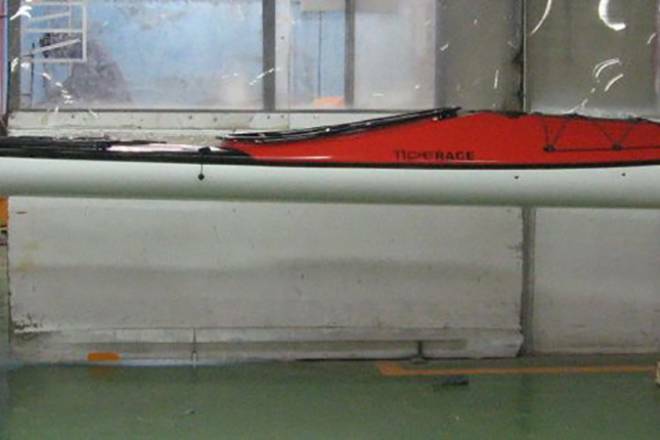 It’s a boat that is very stable when upright, it does not naturally want to rock over onto the chine, it likes to sit upright – very comforting! Secondary stability is huge, but there’s no point trying to over edge, the low back deck goes under and defeats the point of the exercise – overall the boat likes to sit upright and let the rudder do the pointing – this makes it easy to paddle. Manoeuvrability: Responds easily to fine rudder adjustments. Paddles surprisingly well with the rudder up, in fact playing in the eddies and surfing the small standing waves was easier with the rudder up, the boat edge turns very progressively and the bow can be moved about without too much fuss. I need to investigate this more, but paddling about the eddies and waves was almost comparable to an Xcite! Most importantly, how fast is the Pace 18? Speed: Had quite a few sprint and long max-cruising-speed sessions tonight, and its the closest I’ve ever been to JW. Didn’t get much down wind running, but it was raring to go. Best bit was I could keep the power on all the time, the stability is great through the waves and the boils. Across the wind was effortless, boat stayed on track with very little rudder input. At max speed the boat settles down in the water, does not sway or veer about, and settles into a solid glide – it does not feel fast, there’s no drama or splashing, no rocking or bobbing, it seems to stick to the water and move – all very undramatic, but at a very high speed – you almost think your going slow until you look across at your paddling partner who’s thrashing away with water flying everywhere and his boat ripping through the water. My rocking about does not unsettle the boat. It’s also very directionally stable surfing someone else’s wake. The rounded hull and rudder means that you can cross eddylines without edging – there’s nothing to catch – and just keep the power on. Coming soon, more from Aled on the Pace plus some photos of it in the sea!